EUROMAC 2 is an insulated and reinforced concrete formwork (ICF) made from neopor. EUROMAC 2 have a block solution for every situation from super energy efficient blocks with a U-Value of 0.097 W/sq.mK to articulating blocks for curved walls of any radius and angles from 0-180 degrees, also the wall system range includes special elements, such as height increasers, lintels, side-pieces. All the photos of the houses on this website are those which company EKO HAUS DEVELOPMENT has built or supplyed constructions only. Please press on the image for the better view. The EUROMAC 2 system is the economic system par excellence. The energy efficiency of a building is now more relevant then ever. 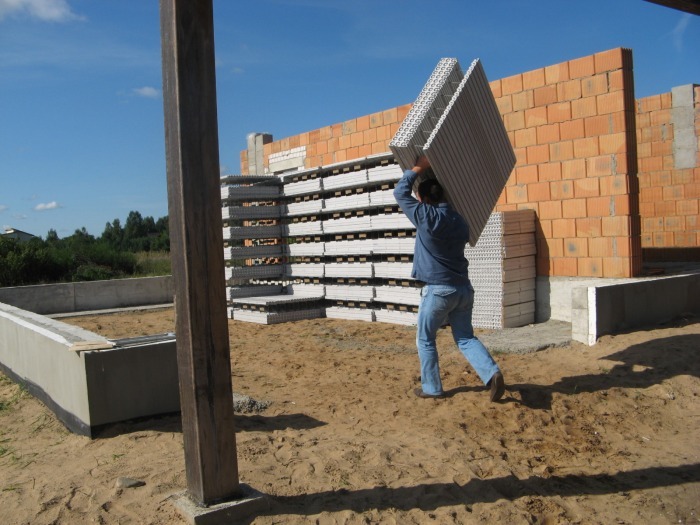 Depending on the choice of wall block the running costs of a EUROMAC 2 building can be 50-84% better than a conventional build (EDF sertificate). Owing to the commitment to lowering our energy consumption the minimum requirements for U-vales on new homes is set to increase. 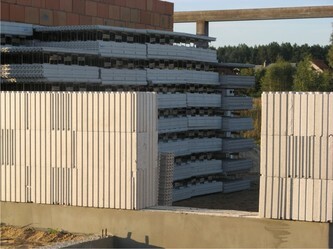 EUROMAC 2 wall construction has a range of wall blocks achieving U-values from 0.29 to 0.097 W/sq.mK. 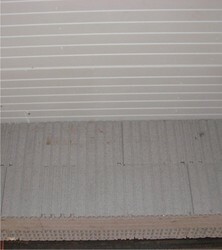 EUROMAC 2 can easily cope with this rise by just increasing the thickness of insulation at very little extra cost. It cost the same amount in labour and for concrete to install a 0.29 W/sq.mK block as it does to install a 0.097W/sq.mK block. EUROMAC 2 is economic in operation, because of a reduction in heating costs and therefore in energy consumption. Also EUROMAC 2 is economic in use because of a lower requirement for equipment on site and unparalleled speed of execution. 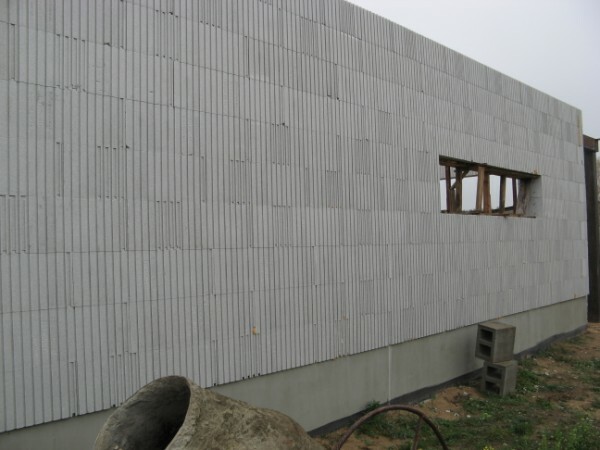 The insulating characteristics of a EUROMAC 2 building are non-discriminatory allowing the building to be cool and remain cool in summer and warm in winter. Getting a building air tight is just as important as getting enough insulation in it. 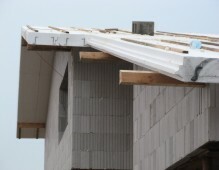 A building with vast quantities of insulation will not perform as well as it might on paper if it is built badly with cracks voids and gaps which allow heat to escape and cold air to penetrate. By ensuring a building is airtight you can significantly reduce: Draughts, Heat loss, External sound levels, Energy consumption, Running costs. The steel ladder frame within the EUROMAC 2 neopor blocks makes wall construction extremely strong allowing up to 4 meters of vertical wall to be poured in a single day. 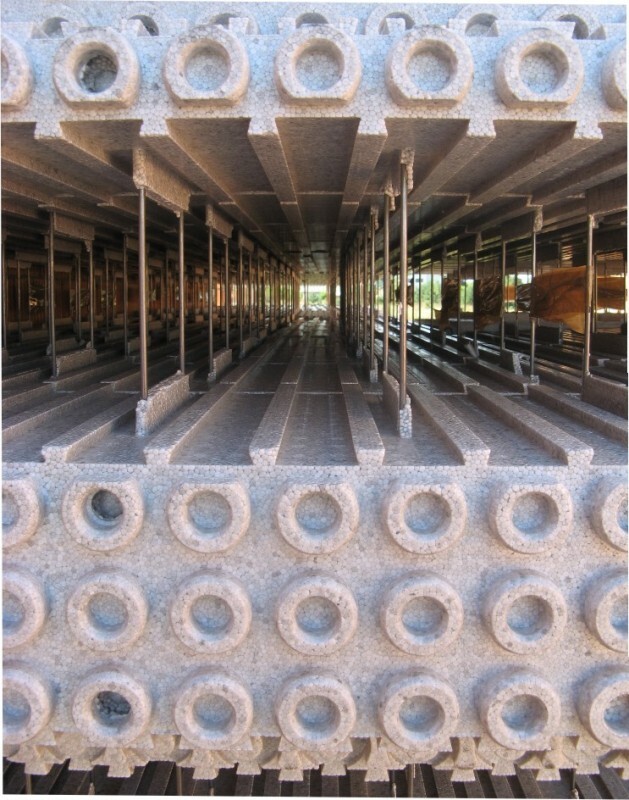 The process results in a monolithic and earthquake-proof concrete wall that is 50% stronger than standard mass concrete walls owing to the curing properties of the insulation. The additional strength and pour height that EUROMAC 2 offers is a considerable benefit over other ICF systems. 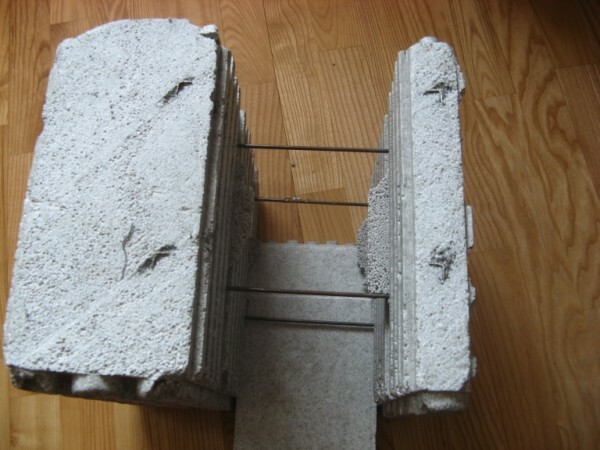 Because the concrete load bearing core is sandwiched between two layers of neopor insulation it acts as a thermal mass storing heat energy, insulating the building more efficiently then timber framed or cavity wall construction. The neopor formwork is a poor conductor of heat/cold energy. Heat energy is trapped within the concrete core of the building creating a thermal mass which retains heat and remains relatively constant fluctuating slightly with the change of seasons. Rooms can be warmed up quickly, resulting in even lower heating costs. Excellent thermal insulation in winter. Excellent thermal comfort in summer. 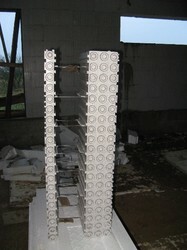 This is an additional advantage of the EUROMAC 2 system due to the heaviness of the outside walls. EUROMAC 2 is ideal when it comes to maintaining air tightness. Because EUROMAC 2 neopor blocks fit tightly together and all the openings are securely closed off. 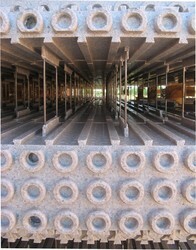 When the concrete is poured into the walls a solid monolithic structure is created. 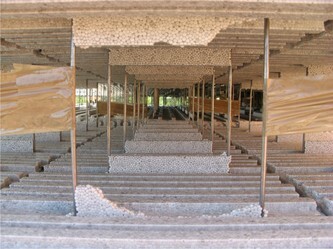 As a result the number of joints between materials and air gaps is drastically reduced. The only possible leak joints on the walls are between the window and door frames and the junction of the roof, all of these areas which need sealing are easily visible and accessible allowing them to be sealed with ease. 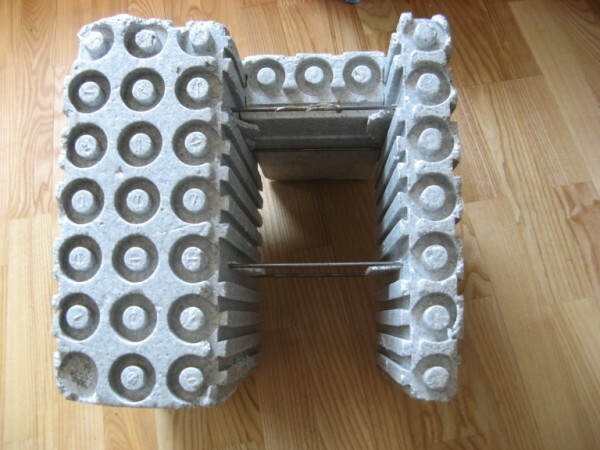 The EUROMAC 2 insulated and reinforced neopor formwork is a poor conductor of heat/cold energy. Heat energy is trapped within the concrete core of the building creating a thermal mass which retains heat and remains relatively constant fluctuating slightly with the change of seasons. This is provided by the external insulation of the EUROMAC 2 system against the action of temperature variations, rain, wind and frost, whose physical and chemical effects are destructive, i.e. wear, fissuring, infiltration, splitting, etc. Labour is the largest percentage cost when constructing a building. The skill level required to construct in EUROMAC 2 is very low, this means workers can be trained quickly and there is less potential for error. 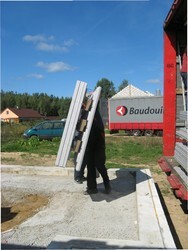 EUROMAC 2 quick and easy to assemble, a team of three experienced installers can complete on average 4-5 m2/hour. Our company EKO HAUS DEVELOPMENT provides full training and product support for all our products and can supply all the equipment and ancillaries need to complete the shell build. 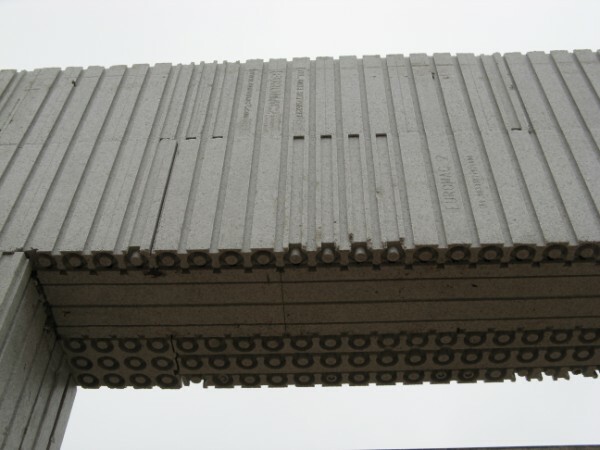 M100/25 wall construction is suitable for insulated foundation, internal walls and outside walls in the Southern countries only. M100/30 wall construction is suitable for insulated foundation and outside walls in the Middle and Eastern Europe countries. M100/35 wall construction is suitable for outside walls in Eastern and Northern countries. Resulting even lower heating costs. 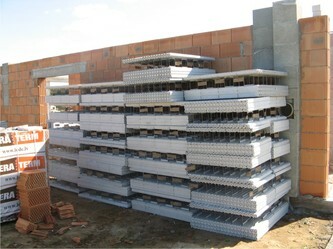 M100/40 wall construction is suitable for outside walls in Eastern and Northern countries. Resulting extremely lower heating costs. 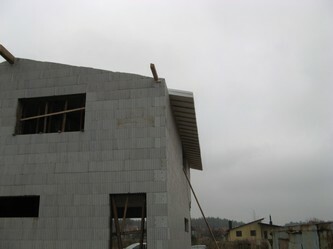 It is used for Passive house outside wall constuction. The three-liter house. 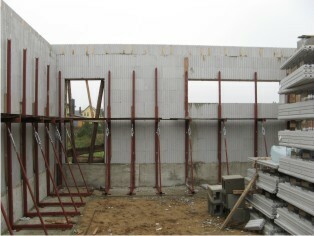 M100/45 wall construction is suitable for outside walls of Passive house. 3. Lintel formers (FL16) to close off door and window heads. 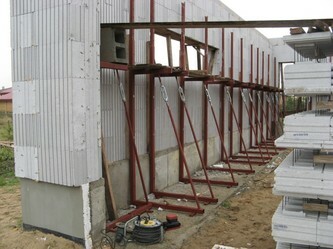 To stabilise the walls during construction metal frames called trestles are bolted to the slab or floor and temporarily fixed to the walls to ensure they remain straight and plumb. 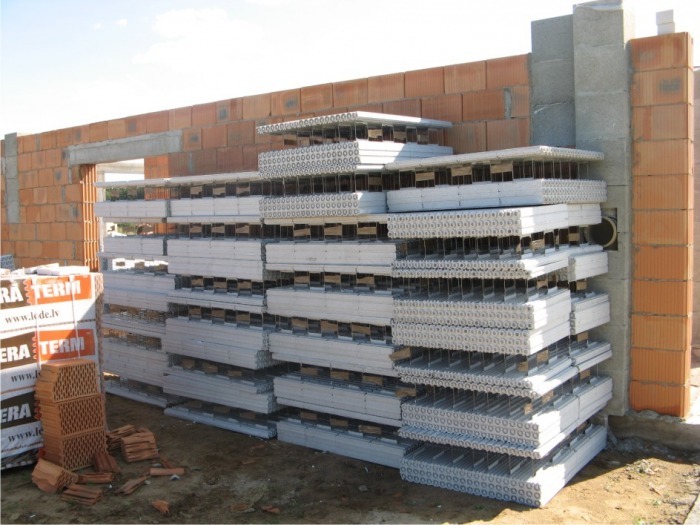 By reducing the number of component parts needed to build the walls, waste is drastically reduced and installation is quicker and easier. 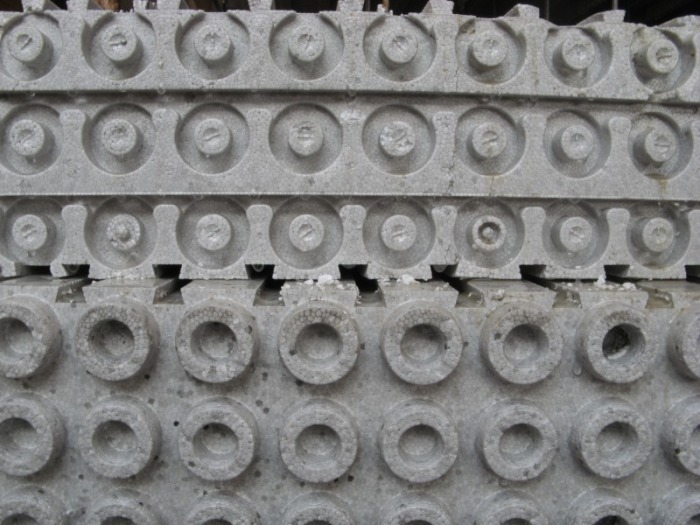 The EUROMAC2 2 block consists of two leaves of neopor that are connected to each other by steel connectors and reinforced laterally by flat steel rods. Moulded castellation on the top and bottom of the block allows each block to interlock firmly with the row above and below the bonds are staggered at each course at no less then 250mm. The steel ladder frame within the blocks makes them extremely strong allowing up to 4 meters of vertical wall to be poured in a single day. 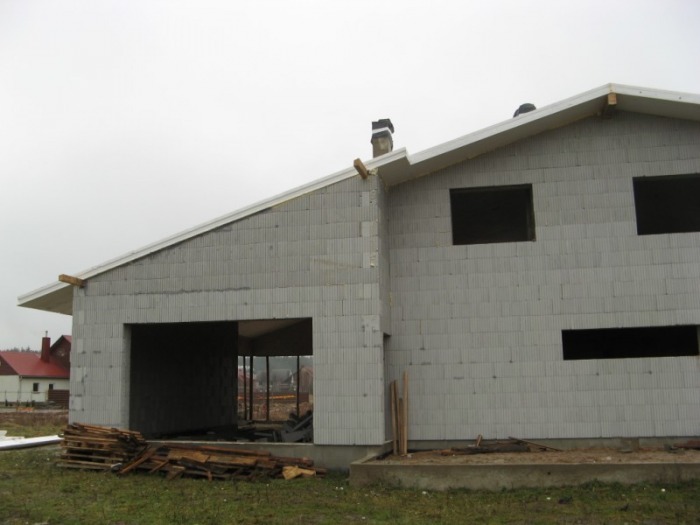 Typically the walls are completed and poured floor by floor but most single story building such as bungalows and garages and including first floor walls with gable ends can be poured in one day. 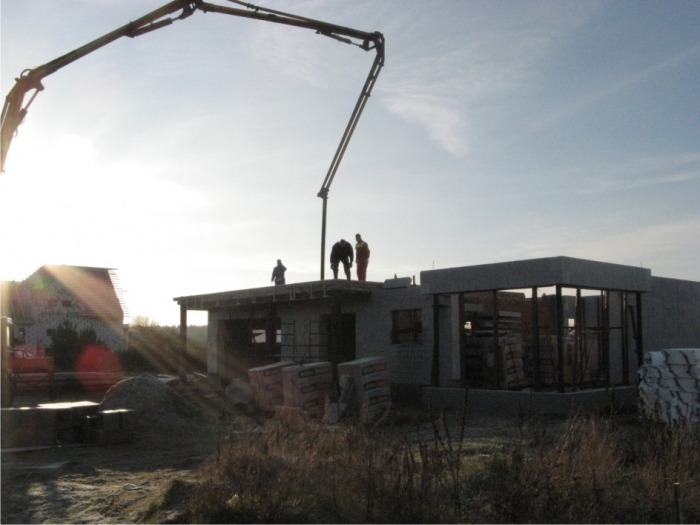 The additional strength and pour height (till 4 m for the first floor) that EUROMAC 2 offers is a considerable benefit over other ICF systems. Most walls above ground need no additional steel reinforcement except in lintels over door and window openings where normally a single 20mm high yield bar is sufficient, larger openings over 2m may require more reinforcement. 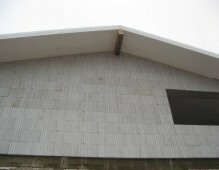 Always installing the thicker insulation leaf on the exterior of the building. 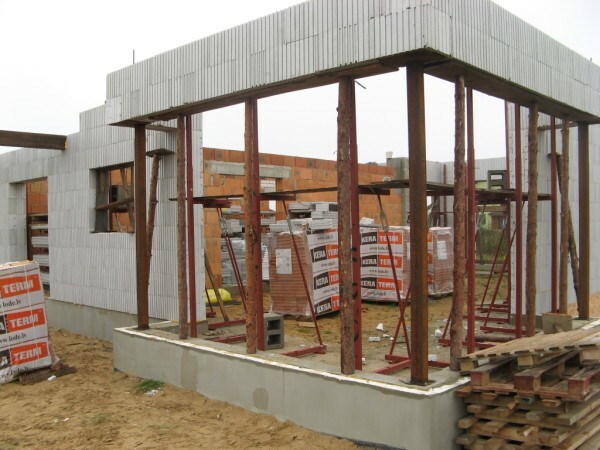 Because the concrete load bearing core is sandwiched between two layers of insulation it acts as a thermal mass storing heat energy, insulating the building more efficiently then timber framed or cavitywall construction. The first two layers of EUROMAC 2 elements are assembled by simple dry jointing with crossed joints (without glue or mortar) up to the heihgt of the next floor on a level slab in the place where the walls are to be built. To stabilize the wall and maintain a level surface, the EUROMAC 2 struts are fixed with struts every one and a half metres along the entire length of the wall and along every opening. 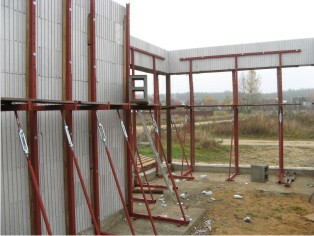 (Company EKO HAUS is renting these struts or you can simply buy them from us). 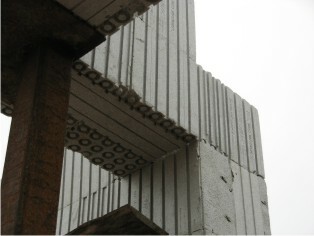 The interior volume created by the EUROMAC 2 elements which act as permanent shuttering, is then pumped full of concrete to the height of the next floor. Once the walls are complete, ready mixed concrete is poured into the walls by means of a concrete boom pump. 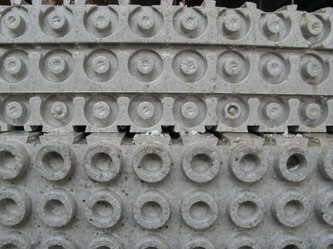 The primary function of the EUROMAC 2 block is to act as a shuttering which will contain the concrete until it has cured. 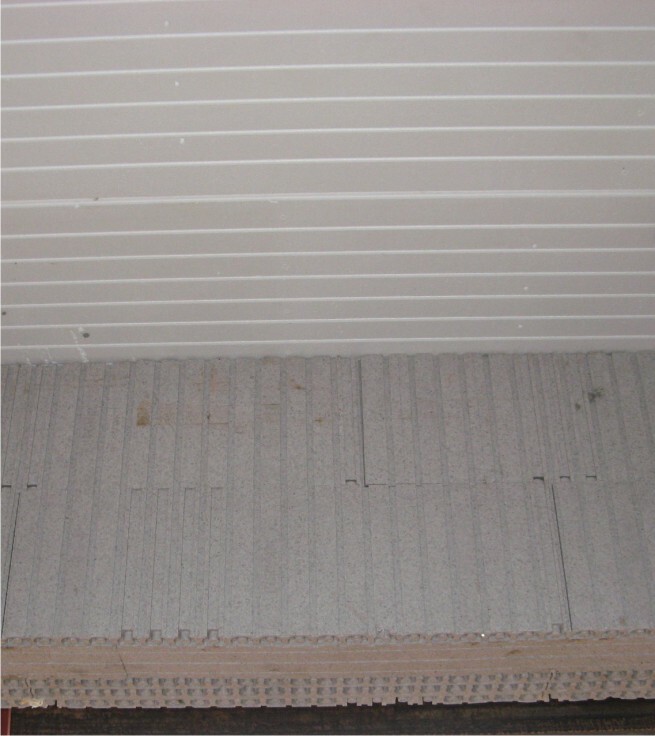 Once the concrete has cured its primary function has been for filed and neopor insulation remains in situ as insulation for the building. 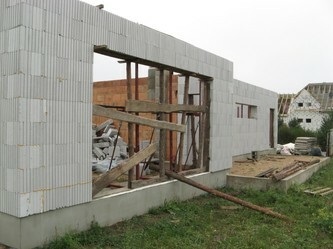 Typically the walls are completed and poured floor by floor but most single story building such as bungalows and garages and including first floor walls with gable ends can be poured in one day. The additional strength and pour height that Euromac 2 offers is a considerable benefit over other ICF systems. Most walls above ground need no additional steel reinforcement except in lintels over door and window openings where normally a single 20mm high yield bar is sufficient, larger openings over 2 m may require more reinforcement. 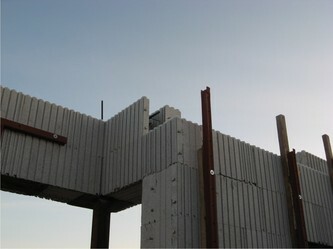 The concrete used for the wall construction is standard unless site conditions require a stronger mix. C25 pump mix with 10mm aggregate at a slum of 80mm-120mm is the preferred specification. 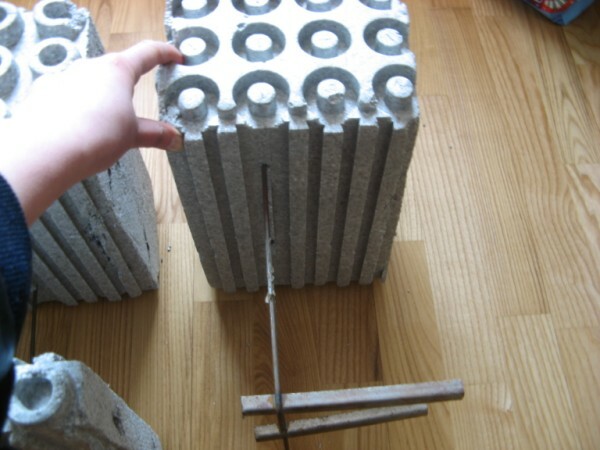 Depending on the slump and if the concrete is vibrated, once cured the concrete core will be around 21N in strength.